There are only a few foods that I crave. Crave, in my case, is not a constant background desire but rather a sudden basic need. If you have ever been [tag]pregnant[/tag], you likely know what that feeling is, its very hard to articulate. I do not [tag]crave[/tag] [tag]chocolate[/tag] although I adore it. I do not crave [tag]krispy kreme[/tag]s, love those. I will be minding my own business, going through a normal day and, bang, I will have a powerful [tag]craving[/tag] for [tag]tofu[/tag] out of the blue. I do the same thing with [tag]beets[/tag], [tag]carrot[/tag]s, [tag]rice[/tag], [tag]mochi[/tag], and [tag]homemade[/tag] [tag]chicken[/tag] [tag]soup[/tag]. The soup is an [tag]umami[/tag] thing, no doubt. The rice and mochi, I still have to figure that out. The beets and carrots? That is related to the tofu and thats all about [tag]phytoestrogen[/tag]s, specifically isoflavones (a type of flavonoid). What, in the name of all that is good and wholesome, are phytoestrogens and isoflavones? Our bodies have evolved a whole host of [tag]receptors[/tag] and [tag]regulatory[/tag] [tag]mechanisms[/tag] (some involved in regulation and [tag]dysregulation[/tag] in [tag]cancer[/tag]) that respond to [tag]estrogen[/tag]. Phytoestrogens are found in plants ([tag]phyto[/tag] is a [tag]Greek[/tag] prefix that implies a [tag]plant[/tag] origin) and they are active [tag]species[/tag] in our bodies. Phytoestrogens can and do act like estrogen, although with likely important differences. In addition to its estrogen [tag]mimicry[/tag], [tag]isoflavone[/tag] [tag]scavenge[/tag]s [tag]free radical[/tag]s like reactive oxygen species (in other words, its a strong [tag]antioxidant[/tag]). I can not stress strongly enough how immensely complex our bodies are, especially the regulatory mechanisms that relate to growth and development. You can not do one study to determine the effect of estrogens and phytoestrogens on people and say anything meaningful. Its like a very big bowl of tightly tangled noodles. You have to tease out unconfounded data and form new hypotheses constantly. Estrogens are nothing to mess around with. It can [tag]feminize[/tag] men into testicular infertility and can energize primary and secondary cancers that arise from estrogen-responsive body tissues. Estrogens are used to pump-up that plump chicken you bought yesterday or to boost [tag]milk[/tag] output in the cows that were milked for that cup of milk you gave your kids this morning. Estrogen-doped foods such as chicken can have a profound impact on the developing bodies of little girls, pushing them into very early [tag]puberty[/tag] (menstruation and breast development). You may think, hey, those hormones were used up by the animals and cant possibly pose a risk to me. The food industry dopes the animals so FAR IN EXCESS of anything [tag]physiological[/tag]ly relevant that even the [tag]effluent[/tag] from [tag]farm[/tag]s (water run off) will have quite measurable levels of [tag]hormone[/tag]s.
The effects of estrogens and phytoestrogens can be counterintuitive as well. [tag]Science[/tag] is learning that phytoestrogens and [tag]synthetic[/tag] estrogens can interact with different parts of estrogen receptors in ways that are different from “human estrogen.” For this very reason, one can have one estrogen mimic promote cancer growth and another [tag]mimic[/tag] inhibit it. Phytoestrogens have been described as protective against certain cancers in some patient populations. Some studies suggest that flooding the body with phytoestrogens that do not have a stimulatory effect (cancer wise) would block the estrogen receptors and thus some of the action of estrogen. Yes, its confusing. Thats what makes Science so fascinating to us scientists. Its also what can be so frustrating to consumers who think that they can demand a one-size-fits-all answer. Be aware that soy containing foods can be a source for phytoestrogens. Try not to get all your protein from soy sources and do not raise your children on pure soy. Eat a variety of protein and vegetables. If you obsess on ingesting a narrow set of foods, you can run into trouble with unknown aspects of those foods and unknown interactions. (pull)Our bodies have not evolved to be pure, they have evolved to interact in complex ways with a complex and diverse world. (/pull) Honor that with healthy diverse wholesome foods and you will be healthy. Phytoestrogens activate estrogen receptor beta1 and estrogenic responses in human breast and bone cancer cell lines. Chrzan BG, Bradford PG. Mol Nutr Food Res. 2007 Feb;51(2):171-7. Differential activation of wild-type estrogen receptor alpha and C-terminal deletion mutants by estrogens, antiestrogens and xenoestrogens in breast cancer cells. Wu F, Safe S. J Steroid Biochem Mol Biol. 2007 Jan;103(1):1-9. Flaxseed and its lignans inhibit estradiol-induced growth, angiogenesis, and secretion of vascular endothelial growth factor in human breast cancer xenografts in vivo. Bergman Jungestrom M, Thompson LU, Dabrosin C. Clin Cancer Res. 2007 Feb 1;13(3):1061-7. Plasma phytoestrogens and subsequent breast cancer risk. Verheus M et al. J Clin Oncol. 2007 Feb 20;25(6):648-55. Epub 2007 Jan 2. Phytoestrogens and breast cancer–promoters or protectors? Rice S, Whitehead SA Endocr Relat Cancer. 2006 Dec;13(4):995-1015. 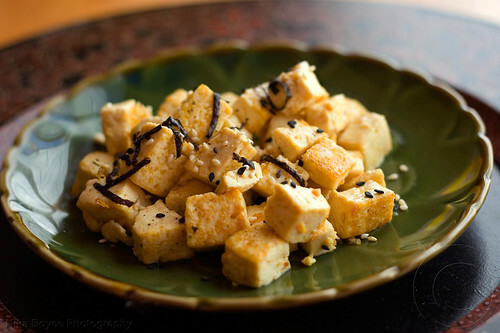 I crave and eat tofu pretty regularly, so I really appreciate this post. Thanks! Susan: Glad I am not the only tofu-craver! glad you liked it. Great post on a complicated topic.